Camera Bags for Women: No Need to Multiply - Just Simplify! Camera Bags for Women: No Need to Multiply – Just Simplify! Are you looking for that perfect bag to meet your photography needs AND compliment your lifestyle? Here are our top picks of camera bags for women – what style will you choose? Hey everyone! So today I want to talk everything camera bag related. Or more specifically, camera bags for women! You see, on an average week, I’m lots of different things to lots of different people. I’m a mom of two toddlers – so I go everywhere with a change bag full of wipes and snacks. I’m a wife, so on date night, I dig out my beautiful leather handbag that gets to see the light of day every so often when I get to go out for dinner for a few hours. I’m a photographer, so every other day I’m pulling on either my big, black ugly backpack that holds all my kit, or a smaller generic camera bag for one lens and body. By the time I get to Friday night, I have no clue which bag my wallet is in, where I last put my SD card or how many snacks have dispersed amongst all of my bags… nightmare right? Thankfully…there’s a solution – I just don’t know why it took me so long to realize it! Ok – let’s get down to business! If you’re on the hunt for a new camera bag that will meet most (if not all!) your needs as a modern, busy photographer of today, here’s the best of the best camera bags for women! I’m all about the style and versatility when it comes to camera bags – let’s face it, that’s what sets the category of “Camera bags for women” separate from the standard, generic bags out there. But just like I know I have to balance style with comfort when it comes to choosing my footwear (as a mom I’m more often found in Converse than Jimmy Choos these days! ), the same applies when it comes to your camera bag. You want to be focused on what’s around you, your subject, the light, the environment. Your bag should simply compliment that by being easily accessible, comfortable to wear and move around with and fit whatever your needs are (photography or otherwise) on a day to day basis. Oh, and look good too of course! To make it easier, I’ve organized my favorites I’ve found by style category. Work out what style of bag will work best for you to wear and be comfortable with, then go to the nitty gritty details to find the perfect bag for you! I’m covering three main types of bag in this article: the handbag style, the messenger style and the backpack style, with a couple of extra bonus ideas thrown in at the end for good measure so keep reading! I deliberately didn’t include the rolling trolley style in here as the topic is camera bags for women… and let’s be honest here, those things may be super functional but attractiveness is way down the list of attributes so they just didn’t make the cut! This retro-modern handcrafted design from Purple Relic is ideal for a multi-use everyday bag. The raw leather exterior means it will change color shades over time, so no two bags will look the same – you’ll have one of a kind! It’s perfect for photographers who carry their entry-level DSLR camera and lens, with room for some small accessories such as spare batteries and cards. 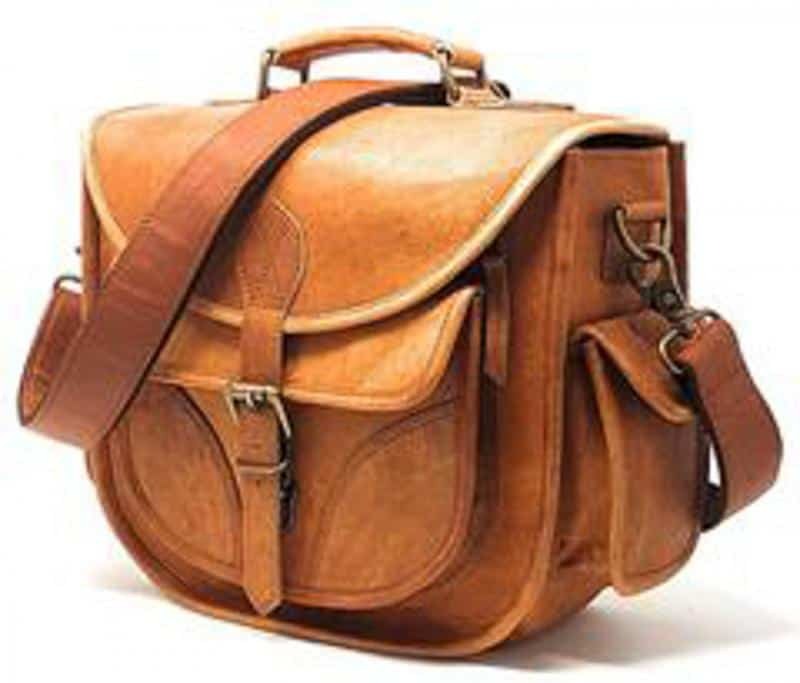 It’s also the bag for those who don’t wish their kit to scream “I’m in here!” as this leather camera bag can easily be mistaken for simply a vintage-style handbag. 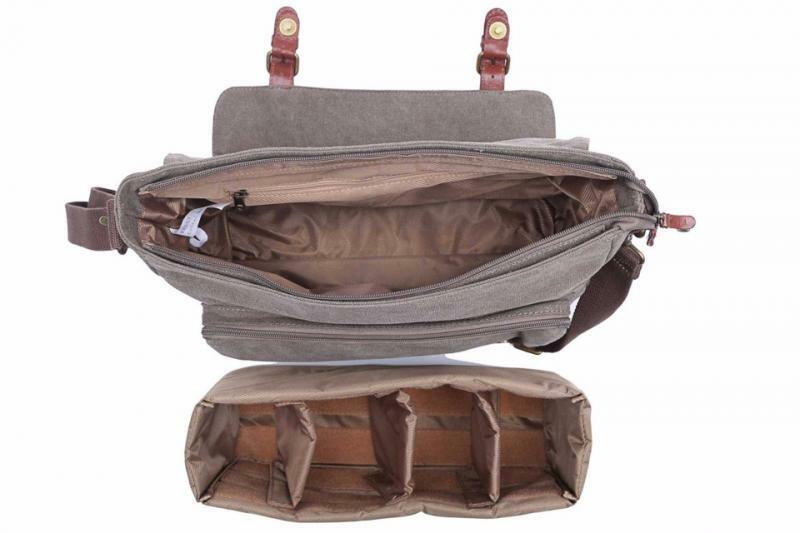 The canvas-lined interior includes an easily removable padded basket for when you don’t need to carry your gear around; it also comes with a removable shoulder strap should you choose to wear this over a shoulder or cross body. I love the fact it has plenty of zipped and magnetic flap pockets, and even an iPad, phone and wallet slot to grab whatever you need easily. The buckle on the front adds a nice authenticity to this bag, although several reviews have reported an issue with the buckle falling off easily. Thankfully customer service at Purple Relic seems top notch as these issues have been reported as resolved quickly. For me, this is a hobby photographer, daily use bag. Stylish and at a pretty good price point, it’s the bag for you if you want to be able to go about your day to day life while having the satisfaction of knowing your camera is quietly stored away until you need it! It’s also pretty cool that it comes packaged in a dust bag – you get that sense of pride and care they’ve put into crafting and transporting this bag to you! They take pride in their camera bags for women and know we’ll appreciate that extra touch! *** Bonus Tip *** – On visiting the Purple Relic website, a 15% off promo code popup appeared, valid on all products – if this bag is for you, go get it fast! Now on to the second in the handbag style category for camera bags for women.. This is a very popular style of bag in the House of Flynn range, known as the Evermore style. Boasting multiple front pockets with zipper or buckle closure to house all your daily essentials such as phone, wallet, keys, and cards (and memory cards), the Garden Floral Evermore is practical yet versatile. A nice stylistic touch is that all pockets maintain the inner fabric design too. The outer material is a waxed, water-resistant canvas so easily wipeable – perfect if you are stuck in the rain, or in my case happen to live with clumsy toddlers! In terms of size, this bag covers all your basics and then some. With 5 detachable Velcro dividers, you can easily organize several lenses alongside your DSLR, including a longer lens such as the 70 – 200 which can fit in easily, even while attached to a camera body, and still leave room to spare! Or on a day off from taking photos, simply remove the dividers and use the bag as a standard, but very pretty, everyday use bag! Unlike the previous bag described, the Garden Floral Evermore has room to house a laptop within the interior compartment which is a nice added bonus. It’s also worth noting that this particular bag is the desired choice of our very own Cole’s Classroom mentor, Kelly Ács! Kelly loves her House of Flynn bags, although she does explain that this bag can get heavy when full. Thankfully, House of Flynn has addressed this problem by updating many of their designs with new concealable backstraps! These allow your trusty handbag style bag to easily transform into a backpack for ease of carrying, all in the time it takes to unzip. For an example of this new updated style in the camera bags for women category, keep reading! The last of my chosen top picks for a handbag style bag comes from a lesser known, family-owned German manufacturer called Compagnon. The Compagnon Unique bag is the bag for you if you want the feel and quality of luxury Italian leather, as this bag is made from pure 100% tanned buffalo leather. Complete with metal feet to elevate and protect the bag, the removable strap can be adjusted to wear as a cross body bag or under your shoulder, suiting all body shapes and heights. Two rolled leather straps make this bag practical to grab and move around also. The shoulder strap and handles allow for the Compagnon Unique to be carried by hand, over the shoulder or as a messenger-type bag, so again proving it’s worth in terms of versatility. The trapezoid shape of this bag makes it easy to carry your DSLR with battery grip and large lens such as the 70-200, plus two more lenses and a few accessories – while still leaving enough room to store a 13” laptop. Keeping up with the organisational trend, the Compagnon Unique has two zipper pockets and several open top compartments for your usual necessities or phone, wallet, notepad, etc. What this bag may lack in terms of being a known brand name, it makes up for in style and workmanship. This is an investment piece – you won’t need or want to go out next year to update your bag from this one. Effortlessly combining style with comfort and function, the larger price tag reflects the time and love put into crafting this elegant choice in camera bags for women. Not only that, but should this be the camera bag for you, all Cole’s Classroom Pro members can receive a free gift when making a purchase of $50 or more, plus free shipping, when you use the link on the Cole’s Classroom Pro webpage under member discounts – how awesome is that?! The Think Tank Photo Lily Deanne is the brainchild of two award winning female artists in their fields – Deanne Fitzmaurice, a Pulitzer prize winning photographer and Lily Fisher, an established camera bag designer. Designed for quick access to your gear with a top flap and wide zipper opening, this is also another example of a bag that doesn’t want to shout out loudly what its contents may be. Even the loud Velcro opening here is replaced with soft close magnets – perfect when you’re set up in that echo-filled church during a wedding ceremony! Ironically, the beautiful blue interior of the Lily Deanne Mezzo grabs your attention instantly as soon as it reveals its glorious sky blue finish. The Mezzo is the middle range size from the Lily Deanne range, capable of holding one DSLR with a mid range zoom attached, plus two or three lenses alongside a laptop up to 11” stored in its own compartment. Further pockets for cards, keys, pens, etc. add to the organisational value of the Lily Deanne Mezzo, including expandable ones for a water bottle which is handy to have! 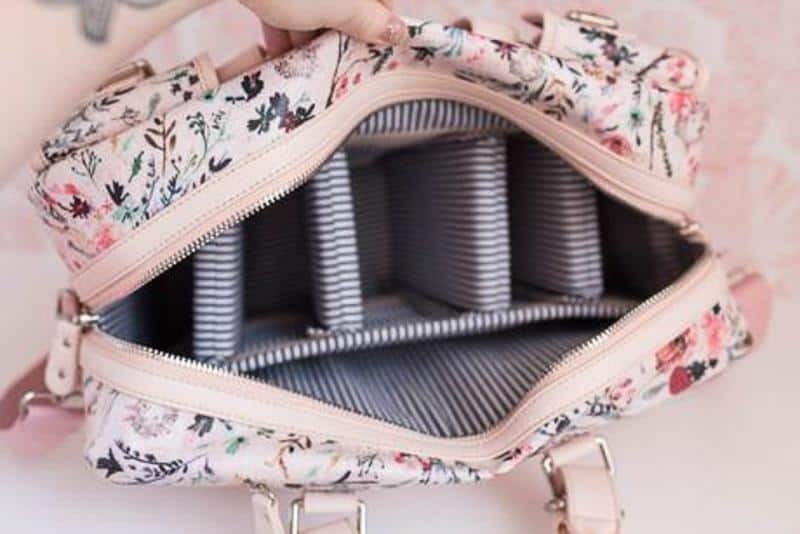 It’s also designed to fit over a rolling bag’s telescopic handle, making it perfect as a second bag when travelling, and can be adapted by removing the inner Velcro walls to suit your needs as required. Thinktank are clearly proud of their products, taking their branding and stamping it in a large logo in the centre of the bag – you’ll either love or hate that feature. It’s also worth mentioning the brownie points you’ll get if you chose this bag to deliver as a gift to a loved one– wrapped in tissue paper within an attractive box, the packaging alone reflects the luxury and quality the ThinkTank Lily Deanna Mezzo exudes. We couldn’t have a list of top camera bags for women without including the well known and loved, Kelly Moore bags. This unisex bag is the “Kate” bag from her canvas collection, named after her trusted colleague. It’s sleek, understated, and attractive – the sand coloured canvas and brown leather trim displaying this bag’s ability to fit in both in a leisure and professional environment. The relatively large size and shape of the Kelly Moore Kate means that you may be tempted to overfill it (remember Kelly Ács’ issue with her bag mentioned above?) so as always with shoulder bags, weight and shoulder strain need to be taken into account. Realistically, this bag can comfortably carry up to a 10″ lens, a camera body, flash, phone, batteries and other little accessories. The shape of the bag means it can stand upright independently to allow you to grab whatever you need during a shoot easily and effortlessly. Several zipper pockets adorn this bag, with the main compartment holding the four-section removeable padded basket (so again this bag is versatile enough to be repurposed quickly for another use.) Additionally, your key essentials such as a wallet and phone can easily be stored close by for easy access, with an extra zipper on the back wall and side pockets for more storage. The versatility of the Kelly Moore Kate continues into the use of the straps – a removeable long strap for over the shoulder or cross body carrying is complimented by a shorter grab strap to quickly move and reposition the bag during a shoot. As always, we are looking for a bag that covers several uses. This bag could easily be an overnight bag, a full-time camera bag or even a day-to-day running around with the kids bag… the opportunities are endless! 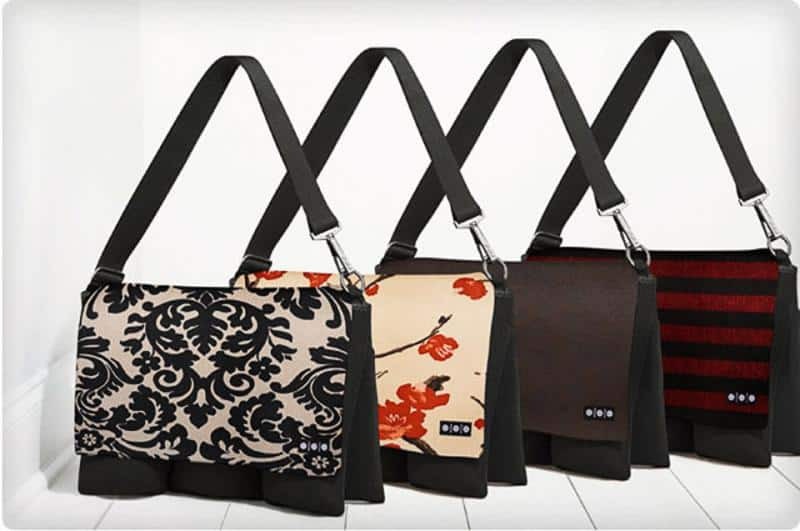 My final pick in the shoulder bags category for camera bags for women had to go to the Jo Totes Gracie bag, a popular online gem with plenty of positive reviews and from first look, it’s easy to see why! With color options ranging from black, butterscotch (a popular choice to go with most outfits! ), mint, magenta or marsala, there is one to suit everyone’s tastes. The quality of this bag is excellent, even with the faux leather material. It’s a relaxed, casual bag that seems to conform to your body as easily as any well-worn handbag would. 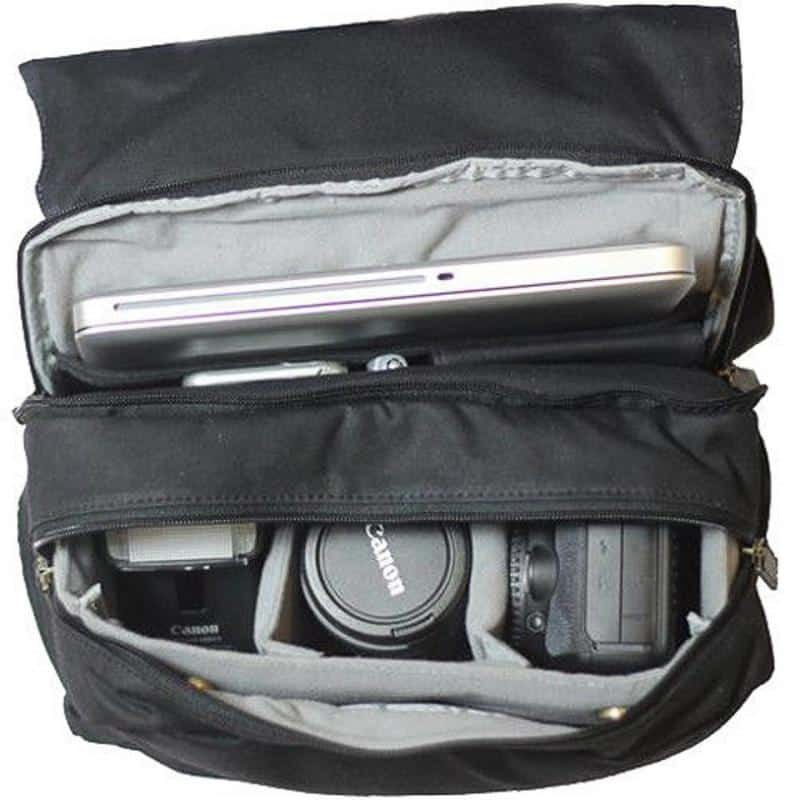 A generous seven pockets organized with four removable inserts allow you to design the interior space to best suit your needs, from a professional camera bag to well, whatever you need a bag for, in seconds! In terms of space, you can easily hold your DSLR camera, two lenses and maybe a flash too, and still, have room to stick something on the top like a sweater or bag of snacks – doesn’t everyone carry snacks or is this just me?! It also has a small zippered pocket for an iPad – perfect for the modern woman on the go. The pockets on the outside are really handy too, for easy access to items like your phone, keys, notepad, etc. The back pocket though is even handier, with a zippered section for maybe your wallet or some cards, and a non-zippered section that to me seemed perfect for business cards or even lens covers – no more sticking a cover in a back pocket or forgetting where you put it down! This bag looks like a bag I would choose to buy anyway as a multi-use everyday bag, casual enough to take to the shops but smart enough to take to any business meeting or formal event. The fact it doubles as both functional and practical in the camera bags for women category (again all whilst deceptively disguised as an average women’s handbag) makes this a winner for anyone worried about being a target for thieves out for expensive camera gear… this bag could just as easily hold lipstick, nappies and a good book. Why does everyone need a prime lens? Click here to find out! We are now edging into the camera bags for women who consider themselves a more heavy-duty photographer. 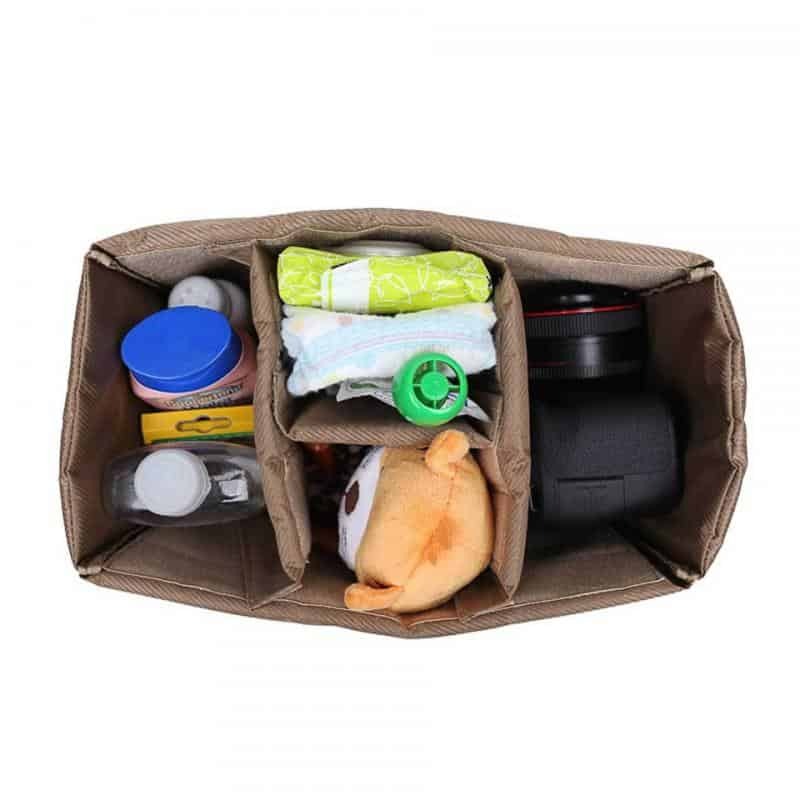 Whether that means filling your bag up with all of your kits to cover all bases on a shoot, or if you are like me and have to juggle lots of things at once, you may find that your backpack has dividers for your camera, lenses, snacks, nappies, toys, and wipes! Whatever it is you choose to put IN your backpack, there’s no reason you should have to miss out on style or funky features. So, after much research, and there were plenty of good options out there, these are my top picks for a backpack to suit every type of woman – whatever your needs may be! Another great one from Kelly Moore next – this unisex genuine leather and canvas backpack will help protect your back and shoulders with the adjustable backpack strap while protecting your precious gear from the elements. Those magnetic closures are found here again with a large distressed leather flap opening, combined with a handy drawstring closure to access and secure your kit quickly and easily. The Pilot is built to be freestanding, leaving both hands free to delve in and retrieve whatever you need – no time is wasted searching and shuffling through a bag here. The simple style and tones of this bag make it easily wearable for men and women alike – with attention to detail such as antique brass hardware and extra padding on the base and sides, this is a sure contender in the style stakes. As with many of the bags listed here, the Kelly Moore Pilot also contains a removable inner basket made up of Velcro dividers, to easily transform this bag in seconds from a standard camera backpack to a multi-use backpack. The added extra here is the Velcro “lid” over the camera basket, which when used with the bag, acts as an extra layer of protection so you can store other items directly on top of it, such as clothes, books, and you guessed it…snacks! The Kelly Moore Pilot can easily hold a 10” lens, DSLR, flash, and several other accessories, with a compartment for a 15” laptop, and two open and one zippered inside pockets. There’s also handy memory card holders, with slots to accommodate both CF and SD cards too. Overall, this bag is a must if you are a fan of leather, aren’t afraid of a few scuffs and marks as it ages, and you are looking for a quality, timeless piece to transport your photography gear, and all else besides, with style! This next contender in the backpack stakes is modern, sleek, simplistic but oh so clever in design! The Jo Totes Bellbrook backpack is American made and oozes sophistication. Its understated branding, found only on a zipper, add a further element of confidence and style to this waxed canvas and leather trim backpack. It kind of reminds me of a bag you’d take to college with you, or even out for a day sight-seeing. There’s something just so cool about it; it’s boxy design and neutral colors still manage to present a feminine charm. It helps that it comes in several colors: black, a greyish-blue and olive. The olive, in particular, seems to work well with the leather trim – although this bag like the others can be adapted to become a multi-use bag, there is something much more elegant, business-like and formal than a casual everyday feel here. In terms of space, you can fit a 15” laptop in one compartment, with the handy side pockets for storage of smaller items. It can easily carry a DSLR and two lenses, or one lens and a decent sized flash. What I love about this seemingly understated backpack though, is the cool little, hidden features! For one thing, the top area is modifiable for bigger items – always a plus to have control over your own organization. But secondly, it’s the fact that the camera gear stashes at the bottom, but just by swinging your bag around you can access it all by using a side access pocket! It’s clear to me that someone has really thought this design through – not having to remove the backpack every time you need to retrieve something is a real plus point here! The inside of the bag is smooth and soft too – so you know your lenses and camera are being cared for within! This backpack is ideal if you’re looking for something modern and sleek, with great control over how you use storage, and ease of access even while wearing it! House of Flynn have very wisely looked at what made their Evermore bags great – and there’s a lot – and then looked at where their bags could be made even better. As Kelly explained above, these bags can get heavy when full up, and being a shoulder bag, the Evermore can then become uncomfortable to lug around as all of the weight is on one shoulder. So, the clever guys down at House of Flynn Headquarters came up with the genius idea of HIDDEN BACKPACK STRAPS! Seriously, I’m a little giddy just thinking about it and mentally working out how long I can really do WITHOUT this bag now they’ve added this awesome feature! The House of Flynn Blush Floral Evermore combines all three styles of bag listed in this article, as it can be worn as a backpack with concealed straps, carried by the leather handles as a handbag or worn over a shoulder using the detachable shoulder strap – It seems so obvious now I wonder if other camera bag manufacturers are maybe kicking themselves for not thinking of it first? The new design has many of the same features of its original predecessor – a waxy, water-resistant finish, interior fabric throughout, multiple pockets with magnetic or zipper closures, and the standard clear memory card pockets and padded shoulder strap for that added touch of style. I really like the print of the Blush Floral bag too – it’s just so darn pretty it makes me happy looking at it! With five pockets to put your camera and lenses in, all with adjustable and removable dividers, there’s no shortage of space with this bag. A 70-200 lens can fit easily into one of these pockets with plenty of space above it for other things too! 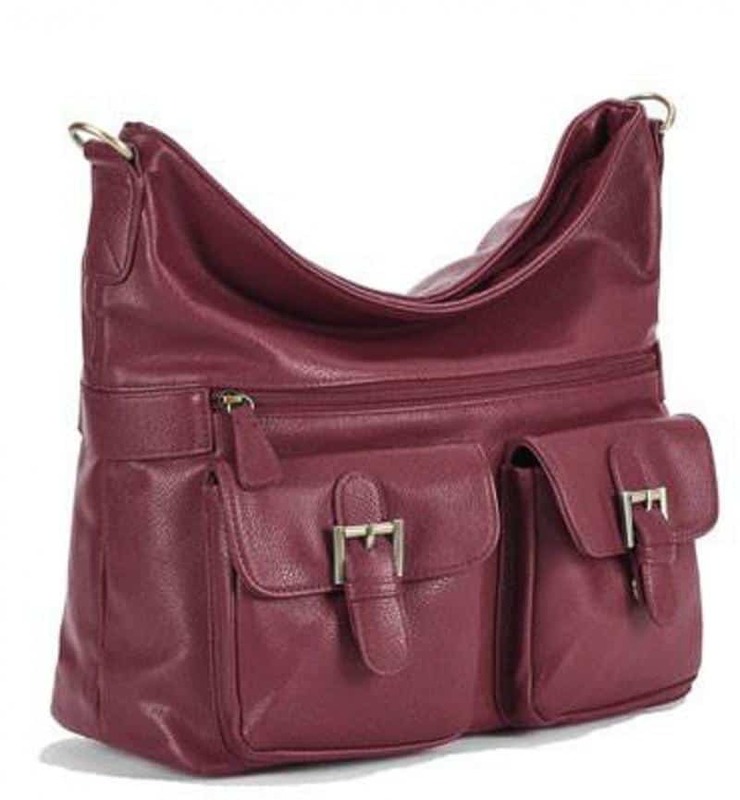 With chunky buckles on the handles and this bag oozes style. A cross body strap is easily removable to transform this bag into a handbag style – again, I think this bag is also perfect as a diaper/change bag or a weekend travel bag too! It’s deep enough to pack your camera and lenses, plus put your laptop in the section at the back of the bag and STILL have room for some clothes on top! Now, those brand spanking new straps! They’re surprisingly soft and padded – but yet easily tuck away into a dedicated zipper pocket. So now you have the freedom of not only how you structure the interior of your bag to suit what you’re carrying, but also the freedom to change up how you wear your bag, anytime you want! Want to know everything there is to know about a telephoto lens? Click here! I know this article is about the best camera bags for women. And I’d like to think you’ve been pretty sold on at least one of the above based on the information you’ve now been given. But if none of these camera bags fit what you are looking for, have you thought about scrapping the whole camera bags for women idea entirely? Honestly, I’m not crazy…. just keep reading! 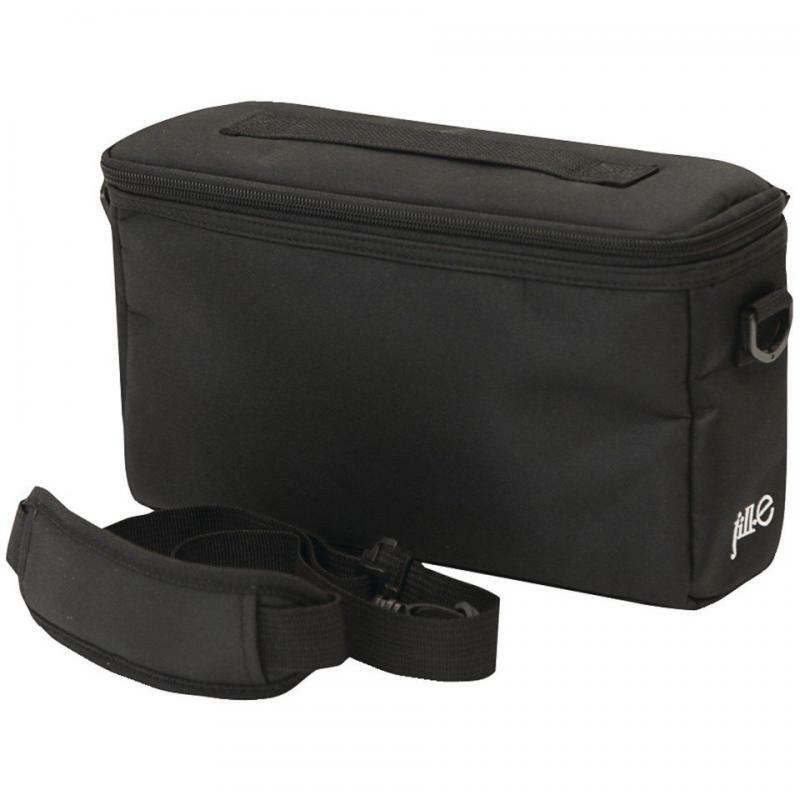 The Jill-e Designs E-Go Camera Bag isn’t actually a bag. It’s an insert. Although it *could* be used as a standalone bag as it has a shoulder strap, that’s not its main selling point here. 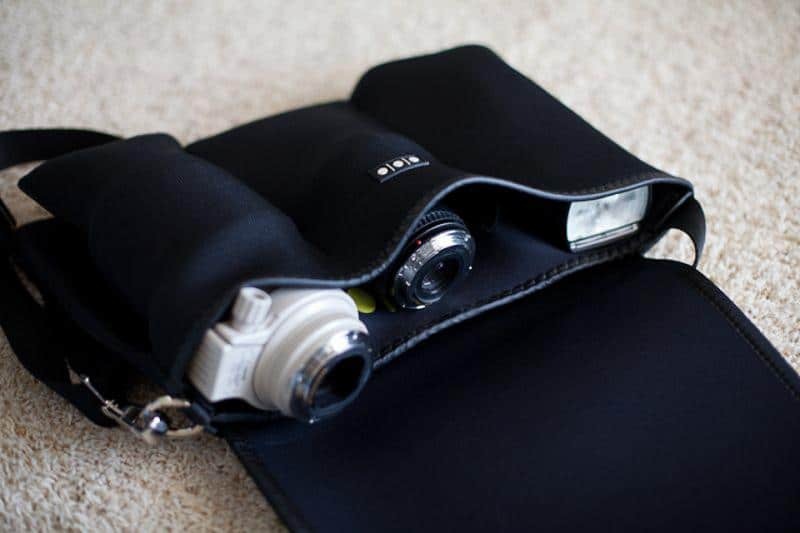 What the Jill-e Designs E-Go Camera Bag insert does, is it allows you to easily convert an existing bag you own into a camera bag (so kind of the reverse idea to what most of the bags listed here do). It’s just a compact, weather resistant, microfibre case with a padded interior and adjustable dividers. 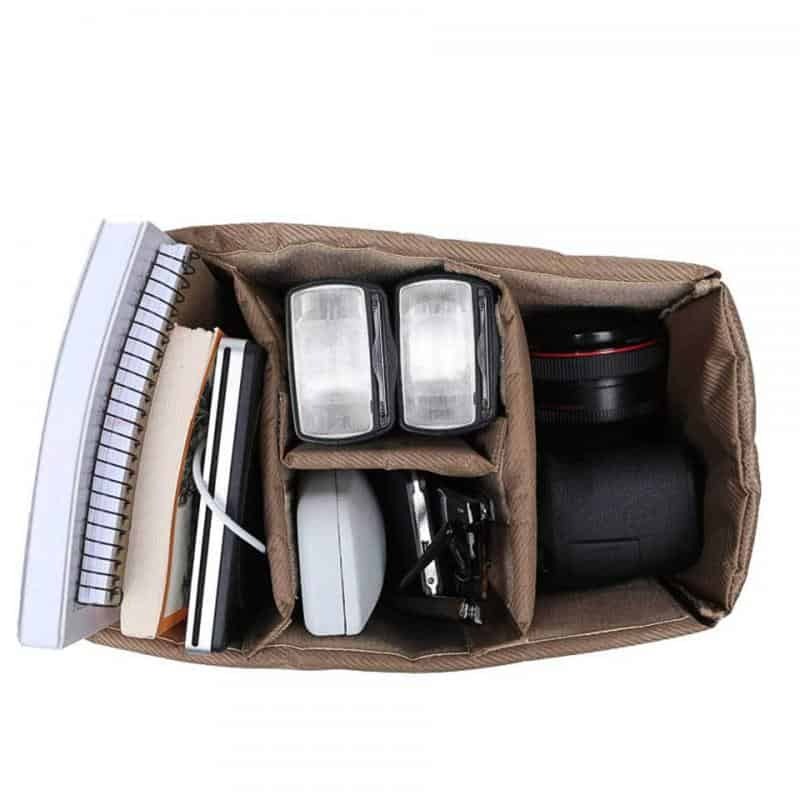 Storage wise, it will hold a small DSLR, one lens and an accessory such as a battery pack or hard drive. A new pocket inside the top flap can be used to hold cards or batteries too. Because it is so light, this is a great alternative for someone with a small kit who are as yet unsure of what type of camera bag to go for. You can simply use this on different types of bags you already own, and then get a feel for what type is going to suit your needs best. At this price point it’s accessible to everyone, so well worth trying out to see if this is the solution you were looking for! If none of the camera bags for women above fit the bill, and even the idea of using an insert wasn’t what you had in mind, my last product that I bring to you today is the Shootsac. Not a camera bag. Not an insert. It’s a bag JUST for your lenses! Now I’ve got to admit, I could see the logic in this product. If you are lucky enough to own a couple of lenses, it can be an arduous task to carry them around in whatever bag you choose to own, then retrieve them and swap them over, then repeat the process later on. If shooting something fast-paced such as weddings is your thing, you might even find you don’t walk around with your camera bag either, so the lenses you have on you are the only ones in that moment you can use until you get back to your storage base. So Shootsac came up with their lens bag: An ultra-light, neoprene bag to wear WHILE you shoot, with three pockets to easily switch over lenses in an instant (and three more pockets they recommend to use for things like water, cards, phone, etc.) It molds to your body, making your lenses feel up to 50% lighter than carrying in a traditional camera bag. I love that it even has an extra clip-on pouch to store your business cards, CF cards and SD cards too! Personally, I think I might buy this as an add-on to my camera bag, rather than an all-out replacement. But I love the concept, and the range of cute designs it can come in, with interchangeable covers so you can personalize it how you want it! Shootsac is so confident you will love their product, they even offer a 30-day free trial. If you don’t like it, simply return it within the 30 days for a full refund… so no risk, only possible gain! As an added bonus, members of Cole’s Classroom Pros can take advantage of a fantastic discounted bundle deal with Shootsac.com. This awesome bundle normally has a retail value of $247, but using Cole’s Classroom discount you can make a massive saving by only paying $199! If you are not yet a member of Cole’s Classroom Pros, sign up today to avail of this amazing discount offer and many more besides! (Seriously, courses, tutorials, resources, perks, bonuses, backstage passes, free goods in the mail, competitions, the SUPER supportive Facebook group, pricing reviews, photo critiques, website reviews, online articles like this one… the list is endless! If you AREN’T a member of Cole’s Classroom, but you are into photography enough to be reading this right now, well you know what you need to do! It’s freaking awesome… just sayin’! So there you have it – no more excuses for going around with five or six different bags for different uses, or leaving your camera at home because you don’t want to take an “extra” bag. There are so many choices out there for your camera bag – covering every price point and style. My choices above reflect what seems to be really popular online at the moment, particularly for women who want to carry a bag that reflects their personal style, that can function as a normal bag when not in use as a camera bag, that can blend in and disguise itself as an everyday bag and that gives them the best experience possible while shooting by providing easy access, secure storage and plenty of space. And of course, as a mama with two active toddlers, I love that these bags can carry endless snacks… and maybe even a snack for me too every now and again! Whatever bag you end up choosing, see it as an investment. An investment in you as a woman and as a photographer. Choose the bag for you that is beautiful, stylish, strong and practical, to remind yourself of all of the things that you are every single day. Want to know how to save money on photography gear? Click here to find out more! Edel Clark is an Irish multi-tasking wife, living in the UK, and mammy to Aaron and Alyssa, two toddlers who are without question her “Why” to everything. A true believer in pushing through all barriers to achieve the life you dream of, she has ticked the boxes of working in the fields of Education, Journalism, and Photography – with the latter being the one that sparks a fire like no other. She mainly focuses on Newborns, Families, Lifestyle, and Weddings, but like many people, struggles to say no just in case she misses something fun! All of the above means that, obviously, she’s addicted to coffee, late night snacking and listening to Bon Jovi on repeat. Her motto? If in doubt, do it – because there’s NO greatest fear than regret. One Response to Camera Bags for Women: No Need to Multiply – Just Simplify! As someone who has a lot of camera bags you left out ONA. I have the Bowery for my mirrorless camera and the Brixton for my DLSR. I love these two bags, little pricey but lots of padding and plenty of room and are great for traveling. Photo Editing 101: Edit Quicker by Batch Editing in Lightroom!